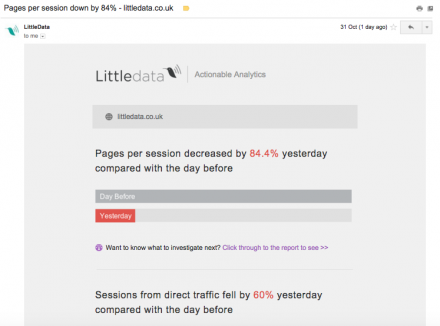 Littledata tool gives you insight into your customers’ behaviour online. We look through hundreds of Google Analytics metrics and trends to give you summarised reports, alerts on significant changes, customised tips and benchmarks against competitor sites. 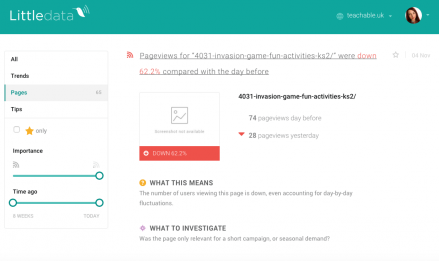 This guide explains how we generate your reports and provide actionable analytics. As a Google Analytics user you will already be sending data to Google every time someone interacts with your website or app. Google Analytics provides an API where our app can query this underlying data and provide summary reports in our own style. But you are only granting us READ access, so there is no possibility that any data or settings in your Google Analytics will change. Once you’ve authorised the access, you pick which Google Analytics view you want to get the reports on. Some people will have multiple views (previously called ‘profiles’) set up for a particular website. They might have subtly different data – for example, one excludes traffic from company offices – so pick the most appropriate one for management reports. We will then ask for your email so we know where to send future alerts to. There are over 100 Google Analytics reports and our clever algorithms scan through all of them to find the most interesting changes to highlight. For all but the largest businesses, day-by-day comparisons are the most appropriate way of spotting changing behaviour on your website. Every morning (around 4am local time) our app fetches your traffic data from the previous day – broken down into relevant segments, like mobile traffic from organic search – and compares it against a pattern from the previous week. This isn’t just signalling whether a metric has changed – web traffic is unpredictable and changes every day (scientists call this ‘noise’). We are looking for how likely that yesterday’s value was out of line with the recent pattern. We express this as signal bars in the app: one bar means there is a 90% chance this result is significant (not chance), two bars means a 99% chance and three bars means 99.9% certain (less than a 1 in 1000 chance it is a fluke). Separately, we look for which individual pages are trending – based on the same probabilistic approach. Mostly this is change in overall views of the page, but sometimes in entrances or bounce rate. The tracking code that you (or your developers) copy and pasted from Google Analytics into your website is only the very basic setup. 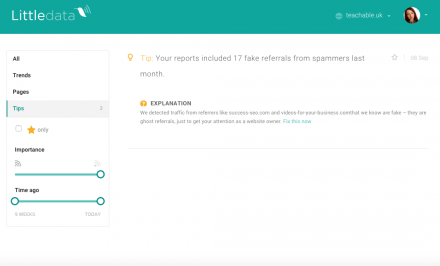 Tracking custom events and fixing issues like cross-domain tracking and spam referrals can give you more accurate data – and more useful reports from us. 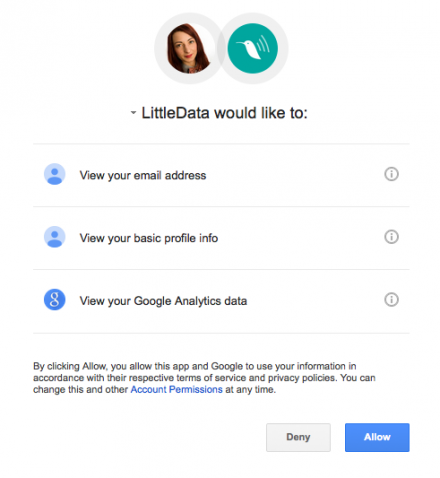 Littledata offers setup and consultancy to improve your data collection, or to do further manual audit. This is especially relevant if you are upgrading to Universal Analytics or planning a major site redesign. Every day – but only if you have significant changes – we generate a summary email, with the highest priority reports you should look at. You can click through on any of these to see a mobile-friendly summary. 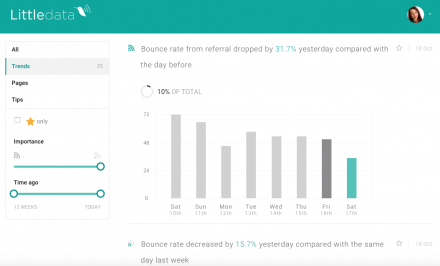 An example change might be that ‘Bounce rate from natural search traffic is down by 8% yesterday’. If you usually get a consistent bounce rate for natural / organic search traffic, and one day that changes, then it should be interesting to investigate why. If you want your colleagues to stay on top of these changes you can add them to the distribution list, or change the frequency of the emails in My Subscriptions. Every week we look for longer-term trends – which are only visible when comparing the last week with the previous week. You should get more alerts on a Sunday. If you have a site with under 10,000 visits a month, you are likely to see more changes week-by-week than day-by-day. 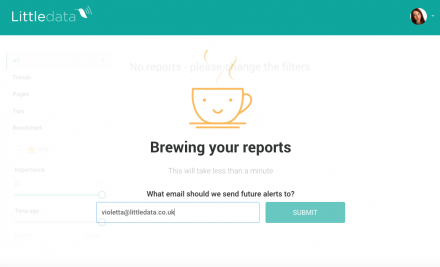 To check the setup of your reports, login to Littledata tool. For any further questions, please feel free to leave a comment below, contact us via phone or email, or send us a tweet @LittledataUK.